For this very special holiday show and store, the gallery will be open everyday from 12-7pm. Surf films will be shown each Thursday at dusk. Shaping on site by Peter Schroff. c.nichols project is pleased to present a selection of art objects and media from the original Schroff Surfboards factory of the 1980’s - along with new work from Peter Schroff and Tony MacKenzie. 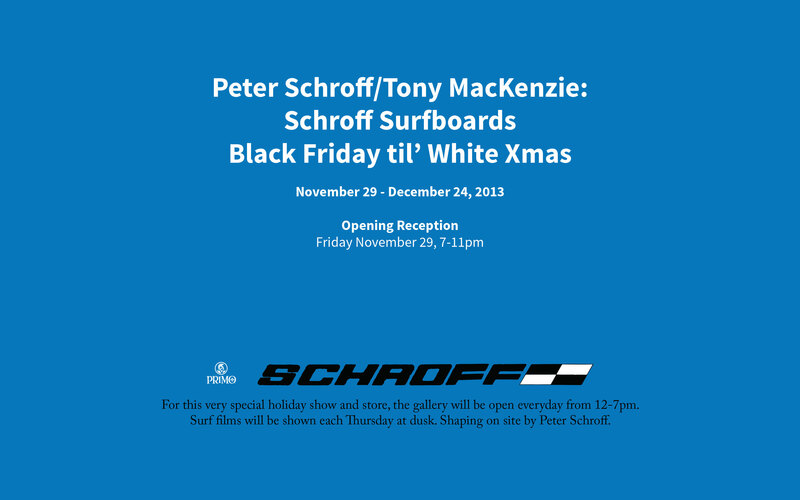 Bringing the iconic Schroff Surfboards concept into the 21st-century, hand screened clothing by Tony MacKenzie will be offered and Peter Schroff will be taking orders for custom boards that he will shape on-site at the gallery. A selection of finished tri-fin, twin-fin and single-fin boards will be available for those who just cannot wait another minute to have one for their very own. An edition of 10 handmade books documenting the Schroff Surfboard story by Tony MacKenzie and Peter Schroff are on view at the gallery as well. A program of surf films will be screened on Thursday evenings at dusk; including a West Coast screening of Daughter (2013), directed by Tin Ojeda, and Surf Nazis Must Die (1987) directed by Peter George. In addition a series of shorts by Alexis Chavez introducing the new Team Schroff riders will be shown. In 1969 Peter Schroff shaped his first board on a kitchen table in his childhood home in Newport Beach. Taking over more and more of the house to accommodate a mushrooming demand for surfboards shaped for his friends and classmates, Schroff was quickly acknowledged as a pioneer within the burgeoning shortboard revolution. Travelling from his home base of Newport Beach to Hawaii and Australia, he continued to surf and refine his shaping techniques. Merging radical forms and function was a hallmark of Newport’s Echo Beach scene. A stint at California Institute of the Arts in 1974 helped hone Schroff’s interest in aesthetics, as he was already crafting a unique style that coalesced with the explosion of neon and humor that would define the era of 1980’s Echo Beach. This aesthetic still informs an aspect of surfing that is alive and vital today. In Southern California Schroff Surfboards was an essential part of a tight-knit group that included major brands such as Rip Curl and Quiksilver. Homegrown shapers and designers at Stussy, Wave Tools and McCoy Surfboards further propelled the energetic scene. Schroff Surfboards was there in the beginning, and he continued to exemplify the era by designing at Gotcha! and Quiksilver. By 1985 Schroff was burnt out by the Echo Beach scene and moved to Los Angeles where he founded 3-A, a downtown performance space. However, the Dogtown scene in Venice Beach, with its arts, surf and skate culture, enticed Schroff to move to there in 1988. It was here in Venice Beach that he would meet Tony MacKenzie, a young BMX rider who had relocated to California from the UK. In 2012 together they began to resurrect the brand known as Schroff Surfboards. For this very special holiday event, c.nichols project will be open everyday from 12-7pm until Christmas Eve. Please check the gallery website for details and additional programming or call 310-915-1930 during gallery hours. Press Inquiries: Please contact Christine Nichols at christine@cnicholsproject.com. c.nichols project is located at 12613 1/2 Venice Blvd, west of Centinela in Mar Vista. Ms Nichols was formerly the owner and director of works on paper, inc. at 6150 Wilshire in Los Angeles.